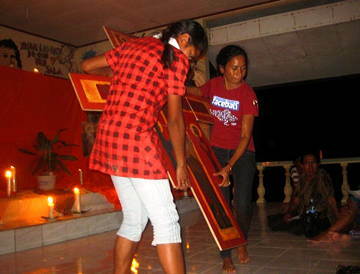 In autumn 2012, a Taizé brother visited Timor Leste. Here is the account of his experiences. As I began to write about these ten days spent in Timor-Leste, I asked myself what had marked me the most, what are the images that have stayed with me from the last few visits and from this one ? Without a doubt, it’s one of men and women going forward towards a goal. Outside the city that image would be different, but in the capital, Dili, it’s very striking. Re-reading some of my previous accounts, I notice that I spoke about the stunning contrast between the extreme beauty of the sea on one side, the mountains on the other and all those young men sitting around the bay, in the streets, trying to sell telephone cards. Now people don’t hang around, people are on the move, advancing towards something ! On the last afternoon, I had a meeting at the YMCA with some young people from different Protestant churches. Whenever you are welcomed by the very generous director, Señor Horacio, it’s a celebration. He invites young people, others less young, or very young, from all over. My visit had been well planned, with a meeting in each of the three dioceses. I had been invited to go to Laga, in the Diocese of Baucau. Arriving the evening before meant I was able to see where the meeting would take place and decide with the parish priest where to hold the prayer. On Sunday morning we were able to take part in the beautifully sung parish Eucharist and to invite the parishioners to join us for the evening prayer. In the afternoon there was time for a song practice and to choose a few songs in Makai, one of the local languages. In the evening, little by little everyone arrived. It was really inspiring; there must have been more than 200 people. The prayer around the cross was a response to a need. During the difficult times, there was much violence in Laga, which means that reconciliation is deeply needed. After the prayer, the parish sister and parish priest said to me : “You know, some real reconciliation was taking place! ". They had seen people making the gesture which in Timor means that two people forgive each other. The Bishop said that the prayer, as experienced as in Taizé, allows the Timorese to express their deep religious devotion. In Tibar, too, which although close to Dili belongs to the Diocese of Magliana, the prayer was full of surprises. Initially it was intended for young people linked with various religious congregations. But the parish, and especially young adults and children, arrived in very large numbers. During the time of group sharing, we had to gather the children together for something more adapted to them. In each group this year’s theme, "Opening ways of trust between humans" was discussed. The children gave perhaps the most beautiful replies. 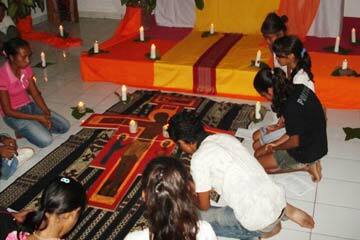 For the Diocese of Dili, the young people met at Don Bosco school. But the most powerful meeting was prayer with 150 prisoners at Becora prison, in Dili. Among them were a few Filipinos and Indonesians. The Timorese are musicians and sang with all their heart songs that they hadn’t known just an hour before. Many of them came up afterwards to say hello, to shake my hand, to say thank you. A great effort is being made for youth education, both by the government and the Church. Language remains a problem because, while during the first years that I visited, Indonesian was still well known and taught, now it has been replaced by Portuguese, but that is poorly taught because the teachers have not been trained to teach it. Tetum is spoken but is not rich enough to express what all that needs to be. That is why education is a priority. The government has at last been able to unify things and to establish standards and criteria to which all institutions are now subject, schools as well as universities, where the levels were so uneven. The Church has opened a university and the Jesuits are building a junior high school. It’s very striking: a whole year in advance teachers are being trained to the academic level required, learning teaching methods and values. They motivate these people in a remarkable way. Many young people feel a call to follow Christ in the priesthood or religious life. Gradually you can see the beginnings of a future and we can only be grateful for the courage of these people capable of daring to trust. 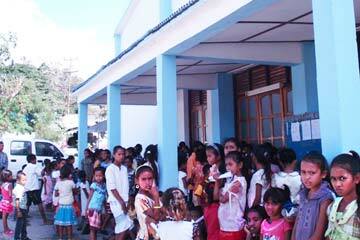 One of the brothers is a frequent visitor to Timor Leste. Here he shares his reflections on a visit he made there in May 2011. “There is great hope for the future, but now we have to get through the present situation”, said a friend I met on arriving in Dili. “There is great hope for the future”… I went to visit the diocesan commission for youth in Dili. The place is very small and narrow, and you have the impression that the team is only camping there. But Jessica, who is a full time worker, welcomes me and says with great conviction, “Welcome to our office. It is simple but it is full of joy, hope and love.” There was so much conviction in her voice that you were full of admiration as you looked at the place. “Now we have to go through the present situation.” When I came last year, I found that for the first time there was a change; a long road had been accomplished. For three years there has been no violence and politically the country is more stable. In 2012 there will be elections and the campaign, like the results, will be a test and an indication for the future of the country. In 2010, experts and lawyers from Australia were discussing questions of exploitation of petrol in the Timor Sea between Australia and East Timor. The agreement provided for an equal sharing of the revenues between the two countries. The first revenues were paid last October. Quite practically, the most urgent need appears to be that of training on every level. Things are many years behind and ten years after independence many people say that progress is very slow. Yet there are new initiatives. A “Teachers Training College”, where studies are conducted in Portuguese (the official language) and in English, should provide teaching that develops the creative qualities of the students. It is as if everything is there in fact, but still has to be awakened. There are other initiatives at grass roots level: the youth commission of the Catholic Church gives courses in computer studies which are indispensable for finding work. The Salesian sisters have opened a bakery so that young people who studying with them can have a job that allows them to earn enough to feed their families. For all those who are committed in this struggle, it is really an act of faith. And this trust is admirable and contagious. As you arrive in East Timor, the plane comes in over the sea. The road into the city goes along the bay. Each time I have come, I have had the same reaction: “What a beautiful country”. But as you entered the city, there were always remains of the war: houses abandoned, windows without glass… This time there is a change for the better. There are new buildings, some streets have lighting, there are no more tents with refugees, the people who had been displaced have gone back to their homes. The youth commissions of the three dioceses (Dili, Baucau & Maliana) had prepared an excellent program. They had invited delegates from each parish. There was often a day with the Letter from China and several hours spent on “how to prepare a meditative prayer”. The young adults who had taken part in the Meeting in Manila did a good job of sharing their experiences. It was the first time they had been out of their country and they had discovered so much, they also realize that they have something to offer to the youth of other countries. The week they spent outside of Manila had made a big impression on them, specially those who went to some of the tribal areas. In addition to the diocesan meetings, there was a half day for postulants and novices from different religious communities. How much things have changed since my first visit in 1991. The young people are highly motivated and many of them appear very mature: a mixture of reserve and a clear awareness of their identity as Timorese. In comparison with other Asian countries, there is a great difference of behaviour and way of expressing themselves. On Sundays the churches are full to overflowing. The young people are aware of the role the Church tried to play for a return to democracy and how much it showed solidarity with the people. The three bishops insist on the importance of prayer. It is clear that the wounds of the past are still present. A young man told me that there are still outbreaks of violence, in society and in the homes, in the families. I asked him how the very young reacted. He told me that the problem lies in the fact that some parents transmit a spirit of vengeance to their children and it is his generation who have to find the narrow way between “not forgetting” and forgiving. 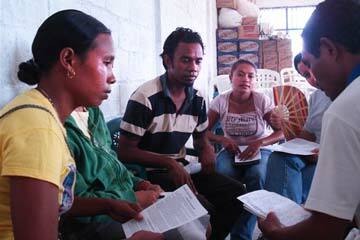 This was the first time that a retreat had been proposed to the young people of the Diocese of Dili. The Sisters of the Sacred Heart offered hospitality in their house in the mountain village of Bazartete. The house includes a kindergarten which was transformed for the occasion into a place of silence. 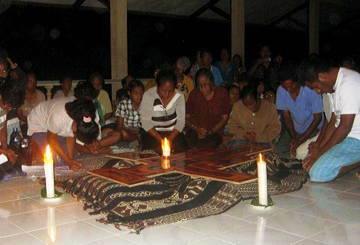 On the Sunday afternoon, everyone went down to Dili for a prayer open to everyone, especially those who had not been able to come to Bazartete. Two problems occurred: the place set aside for the prayer was being used by someone else, and torrential rain provoked a power cut. In spite of everything, it was possible to pray together with several hundred young people. In Venilale, in the Diocese of Baucau, a different kind of challenge was waiting for us. Several hundred young people between the ages of 10 to 25 came not only from the parish and the Salesian schools, but also from nearby Fatumaca. The leaflet containing the songs for the prayer and the Letter from Kenya ran out. The age range of the participants caused concern that the Letter from Kenya would not be understood by everybody. However, the contrary was true and the number of testimonies was so great that they had to be interrupted when the time came for the prayer. In 2007, the parish of Venilale was the scene of much violence. At the beginning of the meeting, the young parish priest spoke of how great a need there was for reconciliation. In 2007, even the children had participated in the violence. After a reading of the first part of the Letter the young people split into groups. Afterwards, one of the chaplains suggested that they explain to everyone what had been discussed. It was impressive to see how many hands shot up in order to ask to speak. Your visit to East Timor came after several years that have been quite difficult because of the violence and political instability in the country. The visit confirmed that there is hope for this country because, through the program and the prayers our young people showed themselves to be “good soil”, where any good thing or project could be planted. We have a big responsibility and we are happy that we can count on your solidarity, support and prayer to continue trying to build this vulnerable and so loved country... Everything that we have planned went very well and flowed smoothly … This is also an important sign because so many times here we have the feeling that even a very short step needs so much energy and trust... Your week here was in some ways very easy and joyful ... Thank you for sharing this true hope, and for walking this part of the pilgrimage of trust with us.